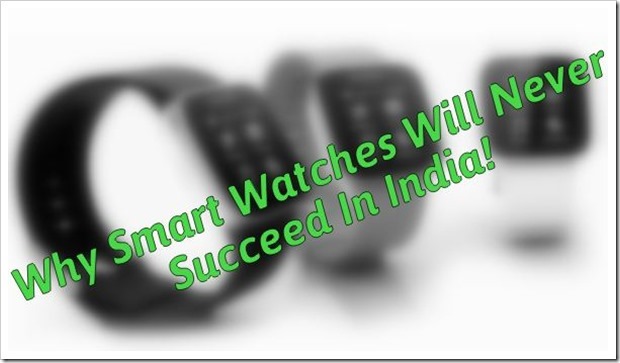 Why Smart Watches Will Never Succeed In India! The rise of smartphones is phenomenal. I don’t think there has been any product that has created such a rampage in the over such short period of time. Mind you, I am not talking about mobile phones here. Just smartphones! The truth of the matter is that at the same price range, everyone wants a smartphone over a feature phone. Another interesting point of note is at the same price range, everyone wants a smartphone over anything else. It is the product to have. They are more of a need for the companies for a new product than anything else. The market for smartphones is getting stable with each company finding a groove. The once disruptive powers of Smartphones are fading and the companies have to come up with some other product to increase their market share/profit margins/revenue etc. It does not require an extra action. Glasses are increasing in use while watches are on a decline. What this essentially means that Google glass if comes within a acceptable price range will have a great chance at succeeding even in India. Smartwatches on the other hand suffer from a few issues which I believe will never let it become even a mild success in India even if it succeeds in US. First issue is that it does not change the effort on a person’s part. There is absolutely no difference in checking the mail by taking out a phone from pocket or looking at a watch. In countries like US or countries of Europe the cold is unforgiving. Smartwatches would ease the act of taking out the phone and looking at it regularly. India on the other hand is a warm country where wearing a watch means a place for sweat to get collected. Secondly, it doesn’t add a feature that a smartphone cannot do. This is important. In India, one cannot sell two products doing the same job. Indians are price sensitive and would not simply buy something if their phone can do it anyways. Third and most important one is the price – Smartwatches are around $200 in price. If we assume that this is the price point that remains consistent for the coming years for good smartwatches, then it is clearly visible that for an average working Indian that is around one-third to one-fifth of his or her monthly salary. In US the same product will be around below one-tenth at least. This is a very important factor if you include the fact that they will also become obsolete as fast as the smartphones do- every year. In India, people generally do not buy a new phone every year (which already cost half of the monthly salary). Thus expecting us to cough up extra money for something that adds minimal functionality is foolishness. So, in my opinion, even if the product succeeds in US, I do not see it having any impact on Indian market whatsoever. If people would have the extra money, they would simply buy a better phone. Indians LOVE Their Jobs, So Much That 18% Will Do It For Free!